Whenever my husband is home (for those new here, he's in the military) and there are no scheduled activities for our family to do, we while away our weekend evening with going to our favorite spa. Sometimes, we leave the girl to his mom so we can have each other to ourselves. Or when we have extra budget, we bring the girl with us that pampering and relaxation become a family affair. We're very clingy like that. We are loyal to one spa for more than two years now but we also try the new ones when we feel adventurous. Or when we haven't booked early, hehe. 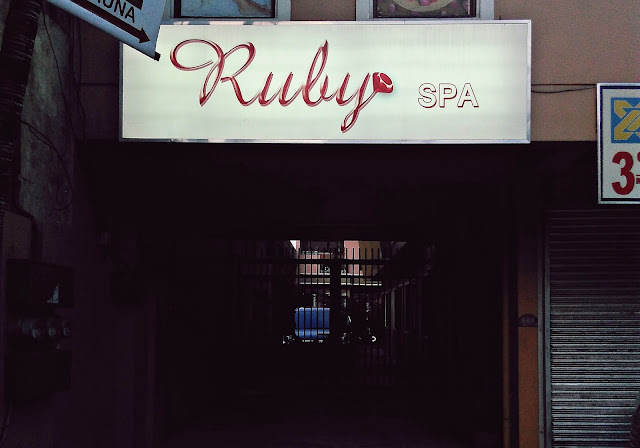 So we feel happy we were given a chance to try the services at Ruby Spa. I also invited my mother-in-law, my sister-in-law, her husband and her kids. Well, it wasn't relaxing to have three kids with us but we had fun albeit their kakulitan, haha! Since the place is strategically located in a busy commercial area, it's easy to look for it. Ruby Spa opened September last year so you can expect that their place is practically new, clean and organized. They have the traditional hilot, Swedish, shiatsu and their signature massage called Ruby's Touch. That's what we all tried. Sophia and her cousin Gabby shared in the one-hour massage. My sister-in-law and I had the same masseuse and we both liked her service. We were very satisfied, which was the opposite of what my husband and mother-in-law thought about the place. This is why I realized that a spa, unlike restaurants and other businesses, depends on its manpower 90% of the time. It has to make sure that the people they hired are competent and hardworking. I thought that the masseuse in charge of all my backaches and lamig was good. My husband thought otherwise for his. Different strokes for different folks, you know. The girl was happy with her 30-minute massage. To be honest, I think I'd consider going back there again next time! I wish, though that they'd make their *system* more organized as I had to call one of the staff when no one was attending to us and it was almost 10pm. But generally, I felt relaxed with Ruby's Touch on my fleshy, meaty body, haha. This post was sponsored by Ruby Spa but all opinions and thoughts are my own. Going to the spa is a family affair for us too. Yun lang, nasarapan ang kids so they expect to get a massage every Friday. Parang weekend starter nila 'yon. Haha!